It never occurred to Milo that someday he would make the evening news. Milo had been working for Dave’s Subs at its original location, mentored by the chain’s founder, Dave Adams, for just under three years. Milo was a good employee, productive and well liked by Dave’s customers. He was so good that Dave tapped him to open and manage the chain’s sixth store. Milo’s journey as a manager began well. For a store opening, it was pretty smooth sailing, until a lunch rush about a month into business. Patti Foster is the managing partner in a powerful law firm, Lawrence, Foster and Sepulveda, in the downtown office building where Milo’s location of Dave’s Subs is located. Patti is an experienced and successful plaintiff’s attorney specializing in suing, on behalf of her clients, doctors accused of medical malpractice. Patti is a neat freak, totally organized in everything she does—she is someone, as they say, who likes her ducks in a row. She’s great at her job, as her law firm’s billboards so eloquently attest. She has one child, now a grown daughter. From all appearances, Patti’s only handicap in life is that she suffers from a severe form of celiac disease, making her extremely intolerant of gluten, a protein found in wheat, rye and barley, i.e., most bread. She runs marathons, she’s on the board of the city’s ballet, and she champions the causes of clients who are hurt by negligent doctors. She’s on top of her game in everything she does. She just has celiac disease. For the one in a hundred people who suffer from celiac disease, avoiding gluten is serious business. Not only are there the immediate effects from the body mounting an immune response to ingesting gluten (think vomiting and extreme abdominal pain), there are potential long-term health effects including damage to the small intestine, development of other autoimmune diseases such as multiple sclerosis, infertility and miscarriage, neurological conditions, and finally, intestinal cancers. Ingesting even small amounts of gluten, as small as crumbs left on a cutting board, can be enough to trigger an immune response. It’s bad, and there is no cure. The only treatment for celiac disease is avoiding gluten. On a warm spring day in April, with the store open a little over a month, Patti decided to try out Dave’s Subs. She’d heard from a colleague that they offered gluten-free rolls. She’d spent an intense morning deposing a very confrontational defendant in a medical malpractice claim. She was thinking ahead to Friday when she had a flight booked to Honolulu to attend her daughter’s wedding. She was exhausted, irritable, hungry, and in a rush. And right there on the ground floor of her building, a tall shiny monument to the city’s vibrant business center, sat Dave’s Subs, a new shop, full of the promise of great food (and gluten-free rolls!) offered with fast and friendly service. Her partners had raved, and today was the day she would give it a try. Alisha Fontaine is a sub “artisan” at Dave’s Subs. On this day, Alisha was Patti’s artisan. Patti ordered the house specialty, a club sandwich piled high with roast beef, turkey, and bacon strips, a few slices of cheddar cheese, tomatoes, green peppers, and mayonnaise, all on a gluten-free roll. Patti checked her phone for email and text messages while Alisha went to the bread storage next to the oven to grab a gluten-free roll. She reached up to the single highest rack of the roll warmer where the morning bread delivery guy would have placed the gluten-free rolls. On this particular day, Milo was out of the shop. For the first time, Alisha was acting as both manager and artisan. It was, so far, a very busy day and Alisha, like Patti, felt rushed and frazzled. As Alisha walked the ten feet to the bread rack to grab the gluten-free roll, she noticed Fred Simpson, another sub artisan, motioning her to come over to his workstation. Her eyes shifted from Fred to his obviously irritated customer. Now wearing her manager’s hat, she wondered what was happening with Fred’s customer. Reaching the bread rack, Alisha grabbed a roll from the top rack. Alisha didn’t look at the roll; her eyes were, instead, firmly fixed on Fred’s increasingly agitated customer who was, by this time, waving his pointed finger at Fred. Clearly something was not going right with Fred’s customer; Fred’s frantic motioning to Alisha was evidence that his problem had become hers. By corporate policy, Alisha was supposed to hold up the roll upon retrieving it, and call out “I have gluten-free!” whereupon a fellow artisan would look at the gluten-free roll, distinguishable by the crosshatch pattern on its freshly baked top, and say “You’ve got gluten-free!” This was the safety check to ensure no single human mistake would result in a customer improperly receiving a regular roll made with gluten—poison to those with celiac disease. On this fate-filled day, the gluten-free rolls were improperly stocked. The usual deliveryman was on vacation and his replacement had not yet covered this route. Delivering the bread an hour later than usual due to a scheduling mix-up with his truck, the deliveryman knew that gluten-free rolls needed to be segregated from the other rolls, but did not know how they were to be segregated at Dave’s Subs. He looked for someone to ask about how the bread should be placed in the rack. He could see the sub artisans were knee deep in slicing and dicing in preparation for the day’s rush. One of the things that drew him to this delivery job was the solitary comfort of driving the truck; once he learned a route, and customer orders, his job required little direct interaction with actual human beings throughout the day. A little shy and now more than a little frazzled himself by the delays and the new route, and with an hour to make up from the scheduling snafu, he put the gluten-free rolls on the bottom rack rather than interrupt the artisans in their food prep. For him the lack of certainty about where to put the rolls caused little stress, given the gluten-free rolls were clearly distinguishable by their unique crosshatch pattern. If they were in the wrong place, any sub artisan would notice as they were grabbing the roll, or surely at the point they sliced the roll to make the sandwich. With a shy smile and a wave to the sub artisans, he was on his way to his next delivery. Milo normally receives the bread order before the artisans arrive for their day. Milo checks every morning that the rolls are properly stocked, whole wheat on the bottom shelves, the big stash of regular white in the middle, and the special, gluten-free rolls on the top rack. Consistency in stocking the breads improves speed and efficiency for the sub artisans and helps to keep spilled food costs low. Alisha, briefed on the pre-opening prep duties, and having actually worked one pre-opening shift with Milo, was nonetheless unaware that Milo checked the bread orders upon intake. In Milo’s quick briefing to his high performing artisan, Milo forgot to share that he personally checked the arrangement of sub rolls. And for the crew of five artisans, it was simply something they took for granted—the rolls were always arranged in the same order, whether it was done by the bread deliveryman, by Milo, or by the gods, the sub artisans gave it no thought. As Alisha turned from the bread rack, she did not call out “I’ve got gluten-free!” The need to do the check was somewhere in her mind. She’d done it many times in her short tenure at Dave’s, and she knew it when interviewed after the event. It was there in her brain, it just wasn’t in her conscious thought at that moment. Instead, as she walked back to her workstation, she was focusing with her full conscious brain on the ordeal unfolding at Fred’s workstation. Whatever was happening between Fred and his customer, it was not good. As she prepared Patti’s sub, as she assembled the turkey club, she did not notice the missing crosshatch pattern on the top of her sub roll. It was there for a reason, offered up by the bread vendor as a special safety feature, the unique pattern on the bread that would keep unsuspecting customers from getting the wrong bread. And, generally, it worked. Every sub artisan could tell of times they caught themselves merely by recognition of that familiar crosshatch on the top of the roll. Without question, it was unique and identifiable. Yet, for whatever reason, it appeared that Alisha did not pick up on the crosshatch cue. She did not realize she was using a normal roll. She did not realize the hazard she was creating. What she was thinking about, and what she was aware of, was Fred’s irate customer. To get to Fred and his customer, time was of the essence, and a focused Alisha pushed through her sub-making task while thinking of her impending approach to Fred’s customer. In a blink, Patti was off with a bottle of lemon-infused sparkling water and her poisonous turkey club sandwich, a first time Dave’s Subs guest with no way of knowing that the roll she carried away was not the gluten-free bread she so specifically ordered. A late bread delivery. A new driver. An improperly stocked bread rack. A first time customer. An employee’s first foray into covering as manager on duty. An irate customer requiring attention. An instinctive reach to a familiar place to find the roll she was looking for. A failure to confirm the roll was gluten-free. Not noticing the crosshatch pattern was missing. It was a series of mostly unremarkable events. No evil actor. No intention to harm. Yet, that was all it took. Within thirty minutes, Patti Foster was on her way to a severe reaction. And it took her only those thirty minutes to know what was wrong. Patti had felt the symptoms before. She knew immediately that there had been a mistake. Within the hour, a colleague was taking her to the emergency room of the very hospital where she had deposed the accused doctor earlier in the day. Within ninety minutes, the diagnosis was confirmed—an adverse reaction to gluten. She would spend three days in the hospital. And she would miss that flight to Hawaii for her only child’s wedding. Patti, the consummate attorney, threatened to file suit against Dave’s Subs while still in the hospital. She granted a hospital bed interview to a good friend, an investigative reporter at a local TV evening news program, just prior to her discharge. She then conducted an interview with another news channel as she stood standing right in front of the store. She shared with the world the dangers of visiting Dave’s Subs and the general dangers of improper food handling. The interview seemed part accusations levied at Dave’s Subs, part trolling for prospective clients injured by restaurant foul-ups. On either side of the story, Patti Foster was clearly incensed and appeared out for blood. Dave’s Subs had let her down; they had breached the duty of the public trust that dining out would not land you in the hospital for three days. Perhaps protecting her interest in Dave’s Subs’ ability to pay out a settlement in the lawsuit she was filing, she fell short of calling for Dave’s Subs to be shut down. She did, however, want Alisha’s head, telling both print and media outlets, “If Dave’s Subs is committed to delivering a safe product, then that woman, my server, should be fired. Dave’s Subs cannot afford to keep on its staff an unsafe employee who is so clearly a threat to our community.” Six years earlier, before the Patti Foster event, Dave Adams was a securities trader on Wall Street. He was pretty successful at what he did. He put in long hours, commuting to Manhattan each day from his home in suburban New Jersey. It was a high stakes environment. His securities firm churned through young traders like they were raw meat. Into the grinder as whole human beings, churned out as indistinguishable links of trader sausage. For Dave, each day was a roll of the dice. Each day a chance that he’d make the big deal, or make the big mistake and be sent home, another trader who was only as good as his last trade. For the most part, Dave had enjoyed the intensity and high stakes of trading, but now with a wife and two young sons, the uncertainty was more than he could handle, more than he wanted to put upon his family. The inherent risk of making a poor trade costing his client or firm nearly unfathomable amounts of money, the vagaries of an economy far outside his control—these posed more risk and uncertainty than he was willing to accept. So, six years ago, in a final high-stakes move, Dave Adams tapped his retirement account to open Dave’s Subs. Dave appreciated the risk of opening a sandwich shop; his fellow traders mostly looked dumbfounded when he asked them what they thought of his idea—“are you kidding me” being one of the kinder and more supportive responses from his colleagues. Dave was good at running the numbers, calculating his potential return on investment. He knew he would be replacing the known stresses of trading with all the unknown stresses of being a small business owner, but the intangibles favored leaving Wall Street. Dave cut his commute from an hour or more each way depending on delays on the train to less than fifteen minutes on a busy traffic day. He was home for dinner most nights and could actually contemplate the possibility of coaching his sons’ Little League teams when they were old enough to play. 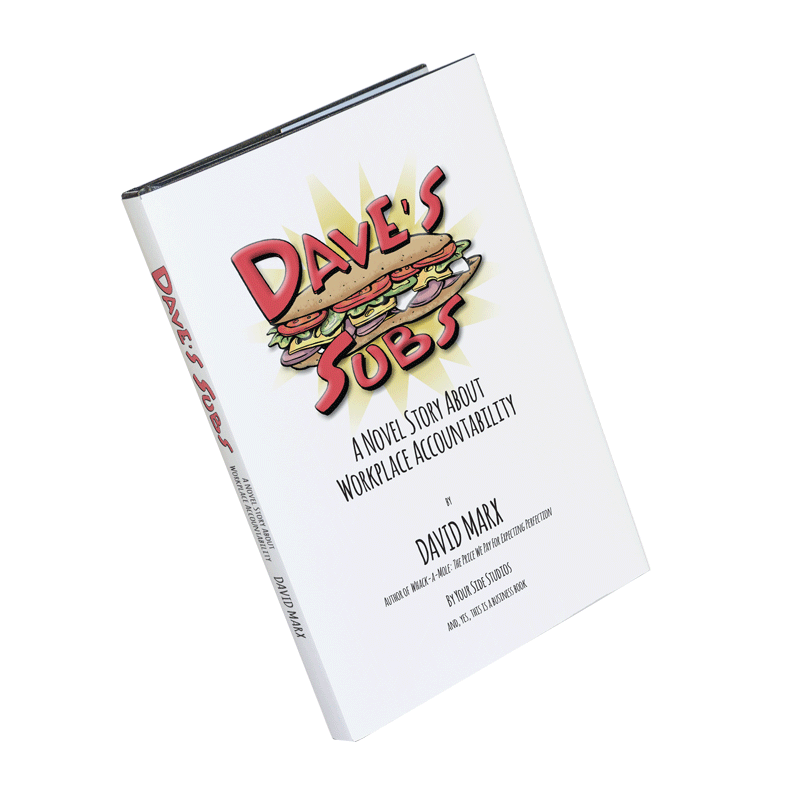 His attention to detail, his insistence on beginning with high quality, locally sourced ingredients (when possible), and his knack for developing quality employees happy to work part time while pursuing other life passions, resulted in rapid expansion for Dave’s Subs—a new location roughly every year. Life was good. Dave felt in control of his own destiny. That is until that warm April afternoon. Dave, Milo, and the entire team at Milo’s store were devastated by the Patti Foster event. They felt awful about the harm to Patti; they were, however, becoming angry at Patti’s continued public condemnation of the store. Dealing with Patti was Dave’s first priority. All he wanted was to silence his once customer now turned adversary. Dave quickly settled for $75,000, with Patti agreeing to stop her public outcry and forfeit any potential litigation. Dave knew the longer Patti Foster was allowed to campaign against his store, the harder it would be for Dave’s Subs to recover. The focus was necessarily on Patti Foster, which left Alisha in purgatory. Would she be fired? When would she be fired? Her peers at Milo’s store were particularly interested to know. And Milo’s employees were not the only ones curious about what would happen with Alisha; across the Dave’s Subs operation, employees watched. Many were of the mindset “there but for the grace of God, go I” as it related to inadvertently grabbing the wrong bread roll. Particularly sympathetic were the artisans who worked with Alisha—all beneficiaries of her sunny disposition and willingness to step in and help where needed. Others, however, wanted Alisha gone. In their mind, she was a threat to Dave’s Subs, and by association, a threat to their own jobs. Alisha screwed up; she sent a customer to the hospital through her screw-up and that had resulted in really bad press for them. Business was down. Alisha needed to go. Dave and Milo were in constant communication in the aftermath of Alisha’s mishap. Once they extinguished the Patti Foster fire, they turned their attention to Alisha. To give themselves some breathing room they put Alisha on two weeks of paid administrative leave. This was not easy on Alisha. Alisha had dreams of going to culinary school, with the goal of someday being a restaurateur herself. She was already taking cooking and restaurant management classes at a community college in the evening. At only 23 years old, Alisha had her life ahead of her. Would this event change her future? Alisha, more than anyone, wanted closure. Dave needed to make a decision. He sought counsel from some of his Wall Street friends, those of the “you’re only as good as your last trade” mindset, from new friends he’d met in the small business community, and from his own legal counsel. They were fairly universal in their advice; Alisha was just unsafe to have around, she was a detriment to the business. Satisfy the masses’ thirst for blood, throw Alisha to the wolves, let the public devour her, and watch them quickly forget about this public relations debacle. That was pretty much the consensus. But these people did not know Alisha like Dave and Milo knew Alisha, or as her coworkers knew her. They only saw her through Patti Foster’s and the media’s eyes—a sub artisan who made the mistake that endangered the life of a customer. For Dave, the advice brought back memories of his days on Wall Street, only now the mantra ringing in his ears was “you’re only as good as your last sandwich.” Starting his own business did indeed bring him a measure of job security, yet one mistake was now putting one of his employees—and potentially his business—on the chopping block. With the settlement behind him, and with Alisha approaching the end of her two weeks of administrative leave, Dave and Milo were still struggling with what to do. It just didn’t seem fair to either one of them to characterize Alisha by this one mishap, this one sandwich, regardless of how dire and costly the consequences. It was also clear that Milo really did not want to play hatchet man in this scenario. He could fire an underperforming employee or somebody who seemed to have too much fun on weekends to actually make it to her substation on time on Monday mornings, but this was different. This was big. And neither Dave nor Milo felt ready to cast that first stone. Now wearing her manager’s hat, she wondered what was happening with Fred’s customer. Reaching the bread rack, Alisha grabbed a roll from the top rack. Alisha didn’t look at the roll; her eyes were, instead, firmly fixed on Fred’s increasingly agitated customer who was, by this time, waving his pointed finger at Fred.Clearly something was not going right with Fred’s customer; Fred’s frantic motioning to Alisha was evidence that his problem had become hers. Six years earlier, before the Patti Foster event, Dave Adams was a securities trader on Wall Street. He was pretty successful at what he did. He put in long hours, commuting to Manhattan each day from his home in suburban New Jersey. It was a high stakes environment. His securities firm churned through young traders like they were raw meat. Into the grinder as whole human beings, churned out as indistinguishable links of trader sausage. For Dave, each day was a roll of the dice. Each day a chance that he’d make the big deal, or make the big mistake and be sent home, another trader who was only as good as his last trade.